1.1. What are High Availability services? WildFly’s High Availability services are used to guarantee availability of a deployed Java EE application. Taking advantage of WildFly’s high availability services is easy, and simply involves deploying WildFly on a cluster of nodes, making a small number of application configuration changes, and then deploying the application in the cluster. If the application makes use of WildFly’s fail-over services, a client interacting with an instance of that application will not be interrupted even when the node on which that instance executes crashes. Behind the scenes, WildFly makes sure that all of the user data that the application make use of (HTTP session data, EJB SFSB sessions, EJB entities and SSO credentials) are available at other nodes in the cluster, so that when a failure occurs and the client is redirected to that new node for continuation of processing (i.e. the client "fails over" to the new node), the user’s data is available and processing can continue. This section summarizes the HTTP-based clustering features. The Infinispan subsystem configures a set of Infinispan cache containers and cache configurations for use by WildFly clustering services. A custom transport capable of sharing a JGroups channel defined by the JGroups subsystem. Uses WildFly’s mbean server, if the org.jboss.as.jmx extension is present. Marshaller configured to resolve classes using JBoss Modules. Marshaller configured with additional Externalizers loadable from the configured module attribute. Configures the mechanism used by clustered caches to communicate with each other. It is only necessary to define a transport if the cache container contains clustered caches. Infinispan supports a number of cache types for use in both HA and non-HA server profiles. A local cache stores a given cache entry only on the local node. A local cache does not require a transport, as cache reads and writes are always local. For more information about this cache type, refer to the the Infinispan documentation. A replicated cache stores a given cache entry on every node in the cluster. A replicated cache requires a transport, as cache writes are replicated to all nodes in the cluster on which the associated cache is running. A distributed cache stores a given cache entry on a configurable number of nodes in the cluster, assigned via an algorithm based on consistent hashing. A distributed cache requires a transport, as cache writes need to forward to each owner, and cache reads from a non-owner require a remote request. A scattered cache is a variation of a distributed cache that maintains 2 copies of a particular cache entry. Consequently, it can only tolerate failure of a single node at a time. Primary ownership of a cache entry is determined by the same mechanism used by a distributed cache, while the backup copy is the node that last updated the entry. This design means that a scattered cache only requires 1 remote invocation to write a given cache entry, regardless of which node initiated the cache operation. By comparison, a distributed cache (with 2 owners) uses 1 remote invocation to write a cache entry if and only if the primary owner initiated the cache operation, and otherwise requires 2 remote invocations. An invalidation cache is a special type of clustered cache that does not share state, but instead ensures that remote state is invalidated any time a given entry is updated locally. An invalidation cache requires a transport, as cache writes trigger invalidation on remote nodes on which the associated cache is running. The configuration of a cache is divided into several components, each defining a specific cache feature. Because a given cache configuration requires each component relevant to its cache type, cache add operations and cache component add operations are typically batched. Any undefined components are auto-created using their defaults. Similarly, you can reset all the attributes of a component by simply removing the component. e.g. How many elements are in the "result" list? The answer depends on how the cache is configured. When the cache is configured to use object memory, our result list has 1 element. When the cache is configured to use binary (or off-heap) memory, our result list is empty. When using binary memory, the cache value must be marshalled to a byte on write and unmarshalled on read, thus any mutations of the cache value in the interim are not reflected in the cache. When using object storage, cache keys and values are stored as Java object references. Object storage may be configured with a maximum size. When the number of entries in the cache exceeds this threshold, the least recently used entries are evicted from memory. When using binary storage, each cache entry is stored as a byte within the JVM heap. Binary storage may also be configured with a maximum size. This size can be specified either as a maximum number of entries (i.e. COUNT), or as a maximum number of bytes (i.e. MEMORY). When the number of entries in the cache exceeds this threshold, the least recently used entries are evicted from memory. When using off-heap storage, each cache entry is stored as a byte in native memory allocated via sun.misc.Unsafe. Off-heap memory storage may also be configured with a maximum size, specified either as a maximum number of entries (i.e. COUNT), or as a maximum number of bytes (i.e. MEMORY). When the number of entries in the cache exceeds this threshold, the least recently used entries are evicted from memory. Non-transactional cache (the default behavior). Transactional cache using a local Infinispan transaction manager. Infinispan transactions are started/committed/rolled-back using Infinispan’s batching API. Transactional cache configured to use the server’s transaction manager, registering as a Synchronization to the current transaction. Cache commit/rollback happens after the associated transaction completes. Transactional cache configured to use the server’s transaction manager, enlisting as an XAResource to the current transaction, but without transaction recovery support. Transactional cache configured to use the server’s transaction manager, with full transaction recovery support. Within the context of a transaction, cache write operations must obtain a lock on the affected keys. Locks may be acquired either pessimistically (the default), i.e. before invoking the operation, or optimistically, i.e. before transaction commit. A cache read may return a different value than a previous read within the same transaction, even if a concurrent transaction updated the entry. This is the default isolation level. A cache read will return the same value as a previous read within the same transaction, even if a concurrent transaction updated the entry. Cache reads are always lock-free unless invoked using Flag.FORCE_WRITE_LOCK. The expiration component configures expiration defaults for cache entries. Cache entries may be configured to expire after some duration since creation (i.e. lifespan) or since last accessed (i.e. max-idle). Indicates whether to refresh persistent state from cluster members on cache start. Does not apply to a local or invalidation cache, nor a shared store. Default is true. Indicates whether cache entries should only be persisted upon eviction from memory. Default is true. Indicates whether cache entries should be loaded into memory on cache start. Default is false. Indicates whether the cache store should be purged on cache start. Purge should never be enabled on a shared store. Default is true. Indicates that the same cache store endpoint (e.g. database, data grid, etc.) is used by all members of the cluster. When using a shared cache store, cache entries are only persisted by the primary owner of a given cache entry. Default is false. A file store persists cache entries to the local filesystem. By default, files are stored in a file named "cache-name.dat" within a subdirectory named "infinispan/container-name" relative to the server’s data directory. A JDBC store persists cache entries to a database. A remote store persists cache entries to a set of remote Infinispan server instances via the HotRod protocol. The state transfer component defines the behavior for the initial transfer of state from remote caches on cache start. State transfer is only applicable to distributed and replicated caches. When configured with a timeout, a cache is only available after its initial state transfer completes. If state transfer does not complete within the configured timeout, the cache will fail to start. Alternatively, state transfer can be configured to be non-blocking, by configuring a timeout of 0. While this prevents timeouts due to large state transfers, cache operations on the new node will require remote invocations to retrieve the requisite state until state transfer is complete. While Infinispan project is used as a library internally by WildFly to provide data distribution, Infinispan project is also distributed in a standalone server mode. The Infinispan Server cluster operates as a language-independent service accessed remotely over a number of protocols (HotRod, REST, etc). and provide advanced cache operations. To learn more about the HotRod protocol itself and how to setup and run Infinispan Server, refer to Infinispan documentation for the appropriate version. WildFly 13 introduced a custom optimized cache store based on HotRod protocol and integrating with security features provided by WildFly’s Elytron subsystem. To configure remote-cache-container ensure you have a list of available Infinispan Server nodes. The following example CLI script first adds socket bindings to two known Infinispan Server nodes, followed by configuration of the cluster. Upon reload, this will register necessary services for the client. A HotRod client can be injected directly into Java EE applications using the @Resource annotation. The HotRod store uses one dedicated remote cache for each cache created by the server. For Infinispan Server versions supporting protocol version 2.7 and above (Infinispan Server version 9.2) a persistent remote cache will be automatically created based on default configuration. The recommended configuration for the remote cache where session data will be offloaded is transactional distribution mode cache with pessimistic locking. When using Infinispan Server version prior to 9.2, the caches need to be configured manually on the server where cache names correspond to the deployment file names (e.g. test.war). The script configures a new invalidation cache. Session data is then maintained in the cache for performance and also written to the store for resilience. Securing the store is just a matter of configuring the remote-cache-container with SSL context. Please follow the Elytron security guide on how to configure new SSL context and Infinispan documentation on how to secure Infinispan Server instances. KUBE_PING is a discovery protocol for JGroups cluster nodes managed by Kubernetes. Since Kubernetes is in charge of launching nodes, it knows the addresses of all pods it started, and is therefore an ideal place to ask for cluster discovery. Discovery is therefore done by asking Kubernetes for a list of addresses of all cluster nodes. Combined with bind_port / port_range, the protocol will then send a discovery request to all instances and wait for the responses. To be able to query the Kubernetes server ensure view permissions are granted on the service account. For advanced configuration options, please visit protocol’s documentation here. The mod_cluster integration is done via the mod_cluster subsystem. There are 3 operation that could be used to manipulate the list of Apache httpd the node is connected to. Tell Apache httpd that it shouldn’t send new session requests to the context of the virtualhost. Tell Apache httpd that it shouldn’t send requests to the context of the virtualhost. Reset the connection between Apache httpd and the node. This document provides information how to configure mod_cluster subsystem to protect communication between mod_cluster and load balancer using SSL/TLS using Elytron Subsystem. Elytron subsystem provides a powerful and flexible model to configure different security aspects for applications and the application server itself. At its core, Elytron subsystem exposes different capabilities to the application server in order centralize security related configuration in a single place and to allow other subsystems to consume these capabilities. One of the security capabilities exposed by Elytron subsystem is a Client ssl-context that can be used to configure mod_cluster subsystem to communicate with a load balancer using SSL/TLS. In order to successfully execute the command above you must have a application.truststore file inside your JBOSS_HOME/standalone/configuration directory. Where the trust store is protected by a password with a value password. The trust store must contain the certificates associated with the load balancer or a certificate chain in case the load balancer’s certificate is signed by a CA. We strongly recommend you to avoid using self-signed certificates with your load balancer. Ideally, certificates should be signed by a CA and your trust store should contain a certificate chain representing your ROOT and Intermediary CAs. Here we are setting the default-trust-store as the source of the certificates that the application server trusts. To use a CRL your trust store must contain the certificate chain in order to check validity of both CRL list and the load balancer`s certificate. This chapter explains how clustering of EJBs works in WildFly. 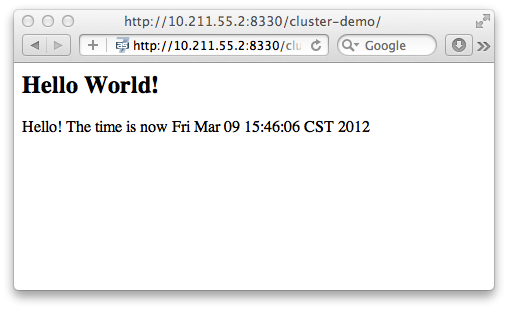 WildFly now supports clustered database backed timers. For details have a look to the EJB3 reference section. 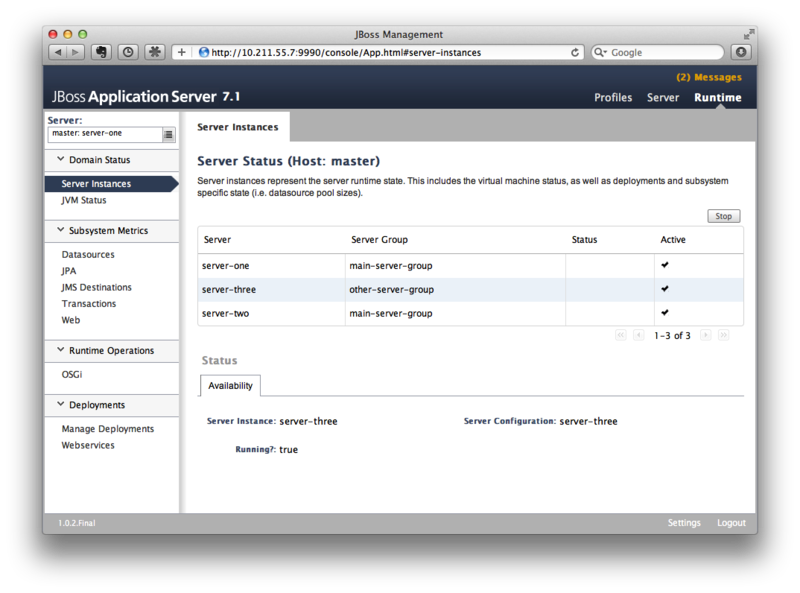 This will start a single instance of the server with HA capabilities. Deploying the EJBs to this instance doesn’t involve anything special and is the same as explained in the application deployment chapter. Clustered EJBs have failover capability. The state of the @Stateful @Clustered EJBs is replicated across the cluster nodes so that if one of the nodes in the cluster goes down, some other node will be able to take over the invocations. Let’s see how it’s implemented in WildFly. In the next few sections we’ll see how it works for remote (standalone) clients and for clients in another remote WildFly server instance. Although, there isn’t a difference in how it works in both these cases, we’ll still explain it separately so as to make sure there aren’t any unanswered questions. In this section we’ll consider a remote standalone client (i.e. a client which runs in a separate JVM and isn’t running within another WildFly 8 instance). Let’s consider that we have 2 servers, server X and server Y which we started earlier. Each of these servers has the clustered EJB deployment. A standalone remote client can use either the JNDI approach or native JBoss EJB client APIs to communicate with the servers. The important thing to note is that when you are invoking clustered EJB deployments, you do not have to list all the servers within the cluster (which obviously wouldn’t have been feasible due the dynamic nature of cluster node additions within a cluster). When a client connects to a server, the JBoss EJB client implementation (internally) communicates with the server for cluster topology information, if the server had clustering capability. In our example above, let’s assume we listed server X as the initial server to connect to. When the client connects to server X, the server will send back an (asynchronous) cluster topology message to the client. This topology message consists of the cluster name(s) and the information of the nodes that belong to the cluster. The node information includes the node address and port number to connect to (whenever necessary). So in this example, the server X will send back the cluster topology consisting of the other server Y which belongs to the cluster. In case of stateful (clustered) EJBs, a typical invocation flow involves creating of a session for the stateful bean, which happens when you do a JNDI lookup for that bean, and then invoking on the returned proxy. The lookup for stateful bean, internally, triggers a (synchronous) session creation request from the client to the server. In this case, the session creation request goes to server X since that’s the initial connection that we have configured in our jboss-ejb-client.properties. Since server X is clustered, it will return back a session id and along with send back an "affinity" of that session. In case of clustered servers, the affinity equals to the name of the cluster to which the stateful bean belongs on the server side. For non-clustered beans, the affinity is just the node name on which the session was created. This affinity will later help the EJB client to route the invocations on the proxy, appropriately to either a node within a cluster (for clustered beans) or to a specific node (for non-clustered beans). While this session creation request is going on, the server X will also send back an asynchronous message which contains the cluster topology. The JBoss EJB client implementation will take note of this topology information and will later use it for connection creation to nodes within the cluster and routing invocations to those nodes, whenever necessary. Now that we know how the cluster topology information is communicated from the server to the client, let see how failover works. Let’s continue with the example of server X being our starting point and a client application looking up a stateful bean and invoking on it. During these invocations, the client side will have collected the cluster topology information from the server. Now let’s assume for some reason, server X goes down and the client application subsequent invokes on the proxy. The JBoss EJB client implementation, at this stage will be aware of the affinity and in this case it’s a cluster affinity. Because of the cluster topology information it has, it knows that the cluster has two nodes server X and server Y. When the invocation now arrives, it sees that the server X is down. So it uses a selector to fetch a suitable node from among the cluster nodes. The selector itself is configurable, but we’ll leave it from discussion for now. When the selector returns a node from among the cluster, the JBoss EJB client implementation creates a connection to that node (if not already created earlier) and creates a EJB receiver out of it. Since in our example, the only other node in the cluster is server Y, the selector will return that node and the JBoss EJB client implementation will use it to create a EJB receiver out of it and use that receiver to pass on the invocation on the proxy. Effectively, the invocation has now failed over to a different node within the cluster. So far we discussed remote standalone clients which typically use either the EJB client API or the jboss-ejb-client.properties based approach to configure and communicate with the servers where the clustered beans are deployed. Now let’s consider the case where the client is an application deployed another AS7 instance and it wants to invoke on a clustered stateful bean which is deployed on another instance of WildFly. In this example let’s consider a case where we have 3 servers involved. 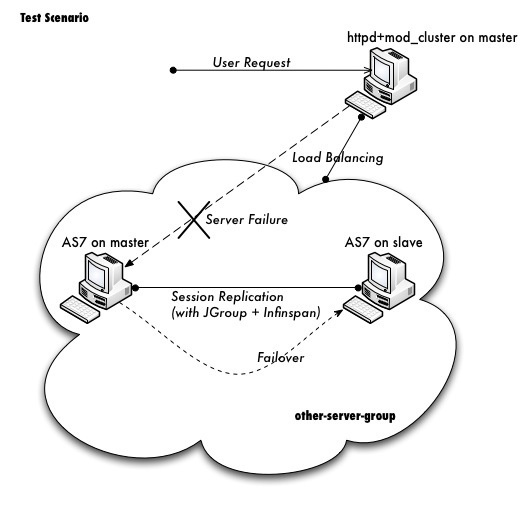 Server X and Server Y both belong to a cluster and have clustered EJB deployed on them. Let’s consider another server instance Server C (which may or may not have clustering capability) which acts as a client on which there’s a deployment which wants to invoke on the clustered beans deployed on server X and Y and achieve failover. The configurations required to achieve this are explained in this chapter. As you can see the configurations are done in a jboss-ejb-client.xml which points to a remote outbound connection to the other server. This jboss-ejb-client.xml goes in the deployment of server C (since that’s our client). As explained earlier, the client configuration need not point to all clustered nodes. Instead it just has to point to one of them which will act as a start point for communication. So in this case, we can create a remote outbound connection on server C to server X and use server X as our starting point for communication. Just like in the case of remote standalone clients, when the application on server C (client) looks up a stateful bean, a session creation request will be sent to server X which will send back a session id and the cluster affinity for it. Furthermore, server X asynchronously send back a message to server C (client) containing the cluster topology. This topology information will include the node information of server Y (since that belongs to the cluster along with server X). Subsequent invocations on the proxy will be routed appropriately to the nodes in the cluster. If server X goes down, as explained earlier, a different node from the cluster will be selected and the invocation will be forwarded to that node. As can be seen both remote standalone client and remote clients on another WildFly instance act similar in terms of failover. WildFly 10 introduced a "singleton" subsystem, which defines a set of policies that define how an HA singleton should behave. A singleton policy can be used to instrument singleton deployments or to create singleton MSC services. WildFly 10 resurrected the ability to start a given deployment on a single node in the cluster at any given time. If that node shuts down, or fails, the application will automatically start on another node on which the given deployment exists. Long time users of JBoss AS will recognize this functionality as being akin to the HASingletonDeployer, a.k.a. " deploy-hasingleton", feature of AS6 and earlier. A deployment indicates that it should be deployed as a singleton via a deployment descriptor. This can either be a standalone /META-INF/singleton-deployment.xml file or embedded within an existing jboss-all.xml descriptor. This descriptor may be applied to any deployment type, e.g. JAR, WAR, EAR, etc., with the exception of a subdeployment within an EAR. While singleton MSC services have been around since AS7, WildFly adds the ability to leverage the singleton subsystem to create singleton MSC services from existing singleton policies. The singleton subsystem exposes capabilities for each singleton policy it defines. These policies, represented via the org.wildfly.clustering.singleton.SingletonPolicy interface, can be referenced via the following name: "org.wildfly.clustering.singleton.policy"
In this article, I’d like to show you how to setup WildFly in domain mode and enable clustering so we could get HA and session replication among the nodes. It’s a step to step guide so you can follow the instructions in this article and build the sandbox by yourself. Make sure that they can access each other via different TCP/UDP ports (better turn off firewall and disable SELinux during the experiment or they will cause network problems). Let’s call one host as 'master', the other one as 'slave'. Both master and slave will run WildFly, and master will run as domain controller, slave will under the domain management of master. Apache httpd will be run on master, and in httpd we will enable the mod_cluster module. The WildFly on master and slave will form a cluster and discovered by httpd. We will deploy a demo project into domain, and verify that the project is deployed into both master and slave by domain controller. Thus we could see that domain management provide us a single point to manage the deployments across multiple hosts in a single domain. We will access the cluster URL and verify that httpd has distributed the request to one of the WildFly host. 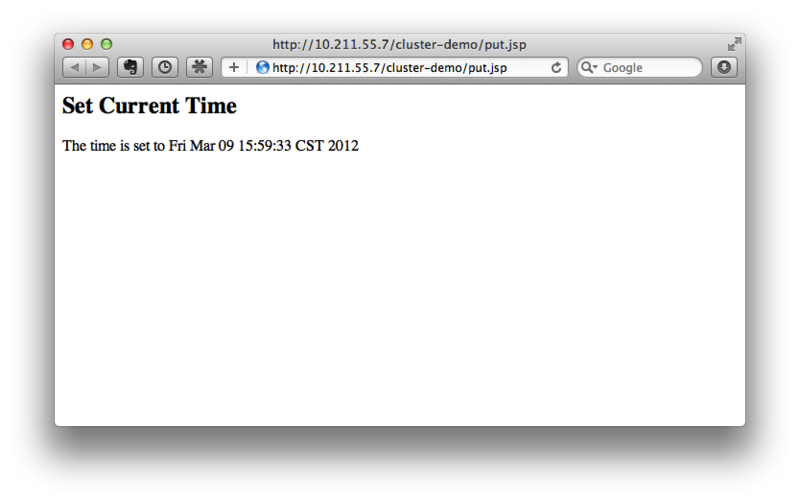 So we could see the cluster is working properly. We will try to make a request on cluster, and if the request is forwarded to master, we then kill the WildFly process on master. After that we will go on requesting cluster and we should see the request is forwarded to slave, but the session is not lost. Our goal is to verify the HA is working and sessions are replicated. After previous step finished, we reconnect the master by restarting it. We should see the master is registered back into cluster, also we should see slave sees master as domain controller again and connect to it. Please don’t worry if you cannot digest so many details currently. Let’s move on and you will get the points step by step. First we should download WildFly from the WildFly website. Now exit master and let’s repeat the same steps on slave host. Finally we get WildFly run on both master and slave, then we could move on to next step. In this section we’ll setup both master and slave for them to run in domain mode. And we will configure master to be the domain controller. 10.211.55.2 is the ip address of the slave. Refer to the domain controller configuration above for an explanation of the management, public, and unsecured interfaces. It is easier to turn off all firewalls for testing, but in production, you need to enable the firewall and allow access to the following ports: 9999. [Host Controller] 20:31:24,582 ERROR [org.jboss.as.host.controller] (Controller Boot Thread) JBAS010901: Could not connect to master. Aborting. Error was: java.lang.IllegalStateException: JBAS010942: Unable to connect due to authentication failure. We will use this user for slave host to connect to master. The add-user.sh will let you choose the type of the user. Here we need to choose 'Management User' type for both 'admin' and 'slave' account. We’ve added server-identities into security-realm, which is used for authentication host when slave tries to connect to master. In secret value property we have 'cGFzc3cwcmQh', which is the base64 code for 'passw0rd!'. You can generate this value by using a base64 calculator such as the one at http://www.webutils.pl/index.php?idx=base64. So the slave host could use the authentication information we provided in 'ManagementRealm'. That means all the configurations are correct and two hosts are run in domain mode now as expected. Hurrah! It’s an extremely simple project but it could help us to test the cluster later: We will access put.jsp from cluster and see the request are distributed to master, then we disconnect master and access get.jsp. We should see the request is forwarded to slave but the 'current.time' value is held by session replication. We’ll cover more details on this one later. We could see server-one and server-two are in running status and they belong to main-server-group; server-three is in idle status, and it belongs to other-server-group. We could see this server-group is using 'ha' profile, which then uses 'ha-sockets' socket binding group. It enable all the modules we need to establish cluster later(including infinispan, jgroup and mod_cluster modules). So we will deploy our demo project into a server that belongs to 'other-server-group', so 'server-three' is our choice. Now server-three is not running, so let’s click on 'server-three' and then click the 'start' button at bottom right of the server list. Wait a moment and server-three should start now. Now we should also enable 'server-three' on slave: From the top of menu list on left side of the page, we could see now we are managing master currently. Click on the list, and click 'slave', then choose 'server-three', and we are in slave host management page now. Then repeat the steps we’ve done on master to start 'server-three' on slave. server-three on master and slave are two different hosts, their names can be different. 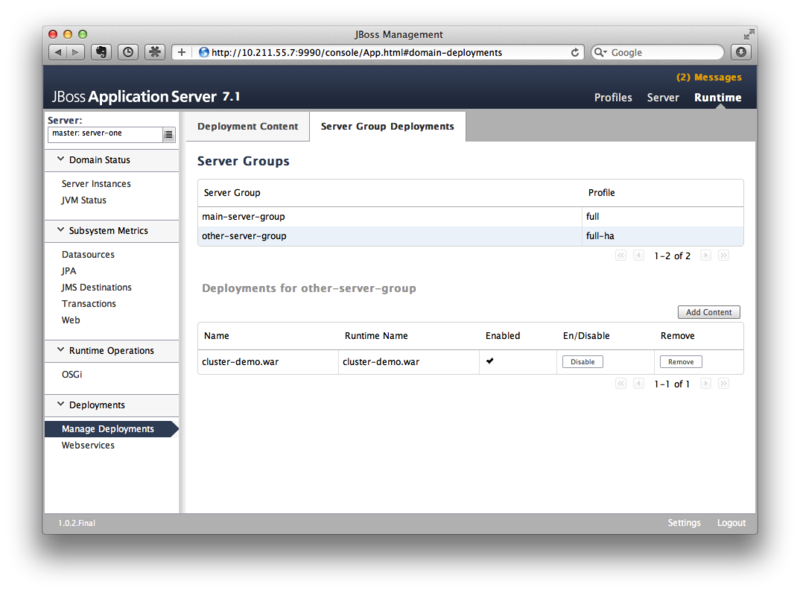 After server-three on both master and slave are started, we will add our cluster-demo.war for deployment. Click on the 'Manage Deployments' link at the bottom of left menu list. After enter 'Manage Deployments' page, click 'Add Content' at top right corner. 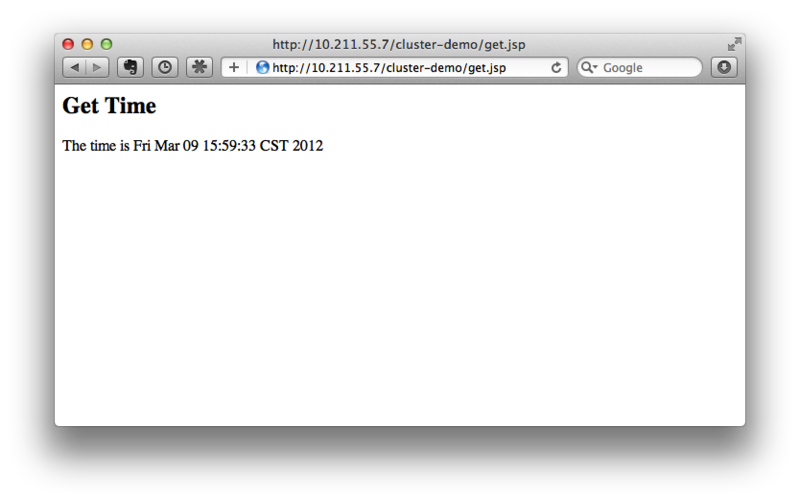 Then we should choose our cluster-demo.war, and follow the instruction to add it into our content repository. 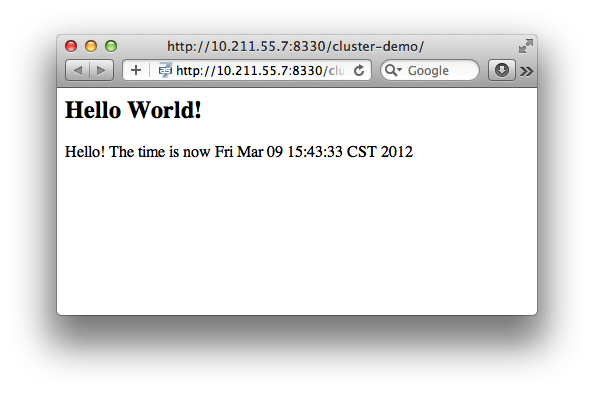 Now we can see cluster-demo.war is added. Next we click 'Add to Groups' button and add the war to 'other-server-group' and then click 'save'. Please note we have two hosts participate in this server group, so the project should be deployed in both master and slave now - that’s the power of domain management. Besides setting auto-start to true, we’ve renamed the 'server-three' to 'server-three-slave'. We need to do this because mod_cluster will fail to register the hosts with same name in a single server group. It will cause name conflict. After finishing the above configuration, let’s restart two as7 hosts and go on cluster configuration. We will use mod_cluster + apache httpd on master as our cluster controller here. Because WildFly has been configured to support mod_cluster out of box so it’s the easiest way. The WildFly domain controller and httpd are not necessary to be on same host. But in this article I just install them all on master for convenience. With mod_cluster-1.2.0 you need to add EnableMCPMReceive in the VirtualHost. # This Listen port is for the mod_cluster-manager, where you can see the status of mod_cluster. # Port 10001 is not a reserved port, so this prevents problems with SELinux. # files from being written to /etc/httpd/logs/ which is not an appropriate location. Now I disconnect master by using the management interface. Select 'runtime' and the server 'master' in the upper corners. Select 'server-three' and kick the stop button, the active-icon should change. Killing the server by using system commands will have the effect that the Host-Controller restart the instance immediately! And from the get.jsp we should see that the time we get is the same we’ve put by 'put.jsp'. Thus it’s proven that the session is correctly replicated to slave. Now we restart master and should see the host is registered back to cluster. It doesn’t matter if you found the request is distributed to slave at first time. Then just disconnect slave and do the testing, the request should be sent to master instead. The point is we should see the request is redirect from one host to another and the session is held. Wolf-Dieter Fink has contributed the updated add-user.sh usages and configs in host.xml from 7.1.0.Final. Jean-Frederic Clere provided the mod_cluster 1.2.0 usages. Misty Stanley-Jones has given a lot of suggestions and helps to make this document readable.